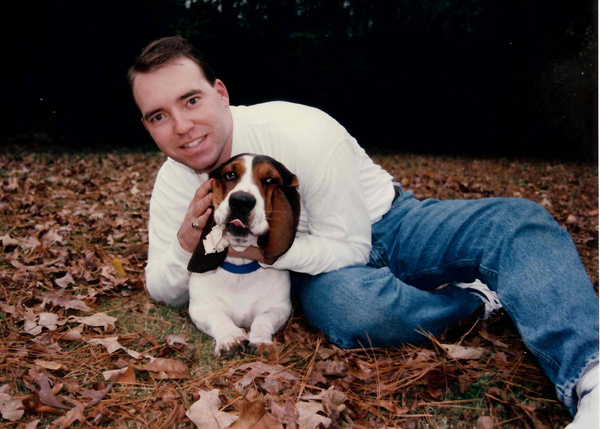 Blazer and Scott in the fall of 1994. This was not the post I had planned for today, but today was the day Blazer needed to leave us. He had been with us for 16 years, outlived his brother by two years and his body finally succumbed to the natural degradation that is old age. He was so tiny at first! 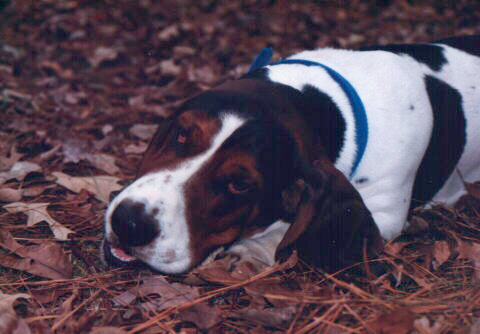 We got Blazer as a baby from a breeder in Alabama while we were students at UAB. 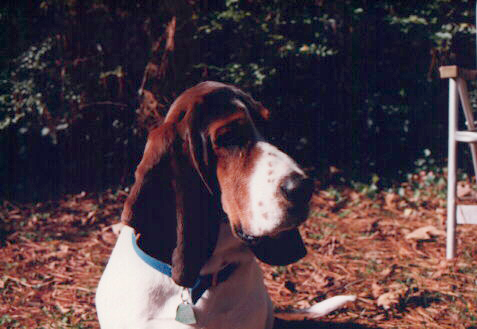 Here he is in the back yard of our house in Homewood, AL at about 6 months old. Blazer spent a lot of time with his brother and his cousin Tanya in Auburn, espceially during the college football season. 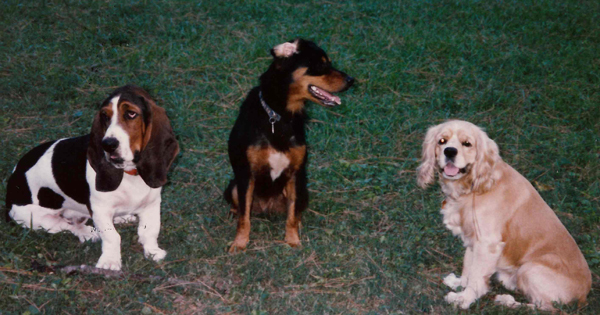 Here are the three of them together paying attention to their various interests. Aubie (the cocker) is looking at the camera (his daddy), Tanya is in the middle and is watching some people play nearby, and Blazer, as always, is looking for the next rabbit to chase. Each watching what is important to them. 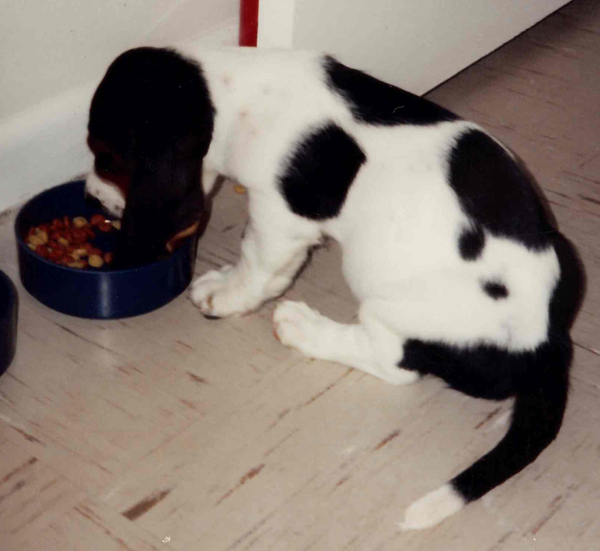 We have so many photos of him and his brother from the past 16 years, so I am just sharing a few. Here he is after we moved out to the farm in 2006. Here he is doing what he did best. Blazer doing what he did best! And, finally, a shot of him last Halloween when he posed for me so gallantly. 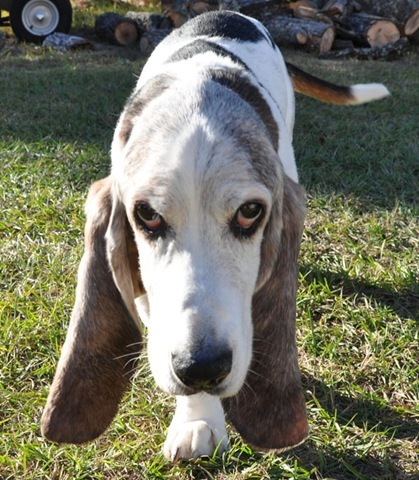 We loved him and will miss him, but we know he will no longer have to struggle to walk, control his bladder, or hold down his food. Blazer is now at peace, August 21, 2009. I’m so, so sorry DK! I know you will miss him. Let me know if there’s anything I can do for you. He was a noble, worthy friend. Rest in peace, Blazer. What a great dog, I can’t imagine how you’re feeling right now. I’m sure he’s in doggie heaven chasing birds and chewing delicious bones! May he cross the rainbow bridge and await you there. I am so very sorry for your loss of Blazer. Loss of our pets is one of the most difficult times in life; especially when we are the one who have to make those decisions. Hugs and prayers to you and Scott. I’m so sorry. 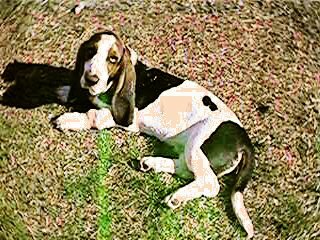 Blazer always had a special place in my hear because he reminded me of Sleepy, the basset that I had as a kid. He was a great dog. I’m sorry for your loss. Thank you for stopping my blog. I appreciate your words. Oh darlin’, I’m so sorry for your loss. He was obviously well-loved and cared for by you guys.